For better or worse, technology is going to significantly transform our lives in the next decade. Pew Research Center conducted a survey, Digital Life in 2025: AI, Robotics, and the Future of Jobs, where they canvassed leading thinkers with open-ended questions about job displacement, education, and social policy due to new technology. Here are some of their insights. One common argument made by the respondents is that our current education system is not adequately preparing students for our technology laden future. The usefulness of rote-memorization, a staple in early education, is questionable for a few reasons. First, just about all content ever created is accessible online at our fingertips whenever we need it. Therefore, rather than being taught to memorize information, students should be taught skills to find and synthesize information and higher order skills like storytelling, judging, decision-making, and problem solving. (I am hopeful that Common Core addresses some of these issues in current and future iterations of the standards.) Second, there will be devices to augment our ability to remember things – something that acts like a hard drive. Google glasses is an example of a peripheral technology device meant to boost our perceptions in everyday life. Let’s teach students to harness new technologies, not memorizing things. Creating, coding, designing, engineering, and analyzing skills will be highly coveted in future careers. Our education system should introduce STEM to students at an earlier stage, and provide the necessary resources for children who want to pursue a related career. For example, provide an introductory coding and engineering class before high school and then classes and programs throughout high school. Most of the respondents agree there will be displacement of workers, but have varying opinions on how it effects the overall job market. Forty-eight of the experts argue displacement will have serious negative consequences. It will polarize the upper and lower classes by hollowing out the middle class. There will be underemployment, which is something we currently experience with early career professionals. But they also predict a new, scarier phenomenon: unemployable workers – professionals who cannot build the skills needed to become employed. Contrarily, the other fifty-two percent of the experts argue enough new jobs will be created to compensate for the lost jobs. Services that are currently very expensive are being targeted for automation. In the medical field, machines are already starting to replace radiologists and anesthesiologist. Hopefully, these advancements help lower healthcare costs. One of the respondents is a lawyer who says computers are taking over supporting roles in the legal profession (researchers, document processors, etc.). Machines and automation may boost productivity enough so we have shorter workdays. Moreover, they will reduce the time we spend doing mundane, routine chores: laundry, grocery shopping, driving, and house cleaning. This would allow for us to spend time being more creative and productive (why many of the big IT companies provide these perks to their workers). Being a technologist, I am optimistic we can find ways to embrace AI and robotics. We need to find ways to share productivity gains achieved from automation with the lower and middle classes. I think not having universal access to a quality education and new technologies would be the biggest contributors to the bifurcation of the classes, so I have two remedies. Provide a free K-12 and higher education. With breakthroughs in online learning, this is possible because there are no real marginal cost in adding students. I am not suggesting revolutionizing the whole higher education system, but rather making sure there is an ‘education safety net’ for those who need it. Make sure some of the new technology gets in the hands of the general public. (Currently some schools in underprivileged areas loan tablets and laptops to their students, so they have access to the Internet and the latest apps. This is a good start.) Also build an infrastructure that delivers high-speed Internet to everyone. Finally, we should continually expand the reach of innately ‘human jobs’ – those that require soft skills, empathy, judgment, and decision-making. Author TheProfessionalWebsitePosted on August 11, 2014 August 12, 2014 Categories Career DevelopmentTags education system, technologyLeave a comment on Where is Technology Taking Us? Why not gamify the process of building and validating skills (stages of a skills-based approach)? Most of us enjoy playing games, so why not make the process of validating skills fun – take out some of the formality when it feels like a chore. It is already happening with computer programmers who are notoriously competitive. They compete in many arenas, such as an open source project where the most elegant solution is accepted or the “cat and mouse” game between hackers and their security counterparts. Any institution can offer a Mozilla badge and design the rubrics (or the game) behind achieving one. Why not create a series of simple games based on difficulty level, where once an objective is passed, the player gets an online badge? Framing the rubrics as a game rather than a rigid test might be more attractive for professionals. I know many people who would play a game, but refuse to take a formal test. Another approach is to create a complex game where there are a few winners (who receive badges for their accomplishment). This is how Codeproject gets a repository of excellently written articles. Codeproject has a monthly competition where developers submit articles based on a technology or application and chooses a winner for the best article in various categories. The winner gets prizes (the July 2013 winner got a mug and two software licenses altogether worth $1,808) and, more importantly, bragging rights (something they can talk about in their experiences). This contest is very effective because it motivates brilliant web developers to write authoritative articles without getting paid – though it validates their skills. Moreover, the real winners are all the developers seeking guidance who get a treasure trove of articles to help them solve problems. I have used their articles in many situations and their quality surprises me considering they are free. A user poses a question on Quora and eager experts respond to it, then an audience ranks the best responses. It is a game because players compete to get the highest ranked response and an overall ranking, establishing credibility for knowledge in a certain subject. Again the audience benefits as they get expert responses to an intriguing question. I think the process of “gamifying” the building and validating of skills can be used in almost every profession. It might be a way to motivate many of us who shy away from promoting ourselves or dislike “doing work after work”. A business strategy which applies game design techniques to non-game experiences to drive user behavior. One partial solution to address the skills gap – employers not filling jobs, while professionals are seeking employment – is the Collegiate Learning Assessment, which is a standardized test for college graduates and early career professionals. It is designed to understand an aptitude with transferable skills (or “critical thinking skills”) for job preparedness, in a similar manner the SATs do for college preparedness. There are many benefits regarding this type of test. First, a professional learns their aptitude in certain skills after completing some form of higher education. If they identify a weakness or want to make an improvement, they take control and find ways to build the related skills. There are many ways to build skills that are cost efficient – buy a book, volunteer, or take a MOOC. Second, educational institutions have objective feedback (in the form of test scores), which they can use to design a more modern-day curriculum that embraces technology and globalization. By reviewing the aggregate results, educators can pinpoint precisely what transferable skills their graduates learned effectively. They make adjustments to the curriculum where there are weaknesses. Third, employers can ask for test results and use them to compare job candidates from many different backgrounds. Making comparisons from a standardized test are more objective than making comparisons on GPAs and college reputations. Moreover, it gives validity to a candidate who takes the test but was educated through a non-traditional learning channel. Finally, the value of MOOCs and other non-traditional learning channels increases dramatically. Someone takes a series of free online courses from top-notch institutions, takes this standardized test, and uses the results to compare their job preparedness with college graduates. A college degree is no longer required, so there is less pressure on getting college credit from MOOCs. A weakness in this type of test is that it does not distinguish technical skills or domain knowledge, something that cannot be standardized for every professional. For example, you cannot have this type of test directly targeting computer programming skills (a majority of the test takers probably never took a programming course) or knowledge of macro-economic policy. An employer uses the test to understand the aptitude a candidate has to build technical skills and may plan a training program based on the results, something I think employers must do to close the skills gap. The best way to validate technical skills is to provide samples of coursework (if possible), certifications, references, and/or online badges (as discussed in a skills-based approach). The skills gap… “Only one in four employers think that two and four-year colleges are doing a good job preparing students for the global economy.” (2010 survey conducted for the Association of American Colleges and Universities). Douglas Belkin. “Colleges Set to Offer Exit Tests,” Wall Street Journal, August 25th, 2013. Supporting STEM (“science, technology, engineering and mathematics”) programs are becoming increasingly important in education policy. The last two presidents have created or amended initiatives to improve the preparedness of our workforce in STEM fields (Bush with the American Competiveness Initiative and Obama with Mathematics and Science Partnership) It impacts our economy and job market, especially as competition for STEM jobs goes global. We currently have a shortage of skilled workers in STEM fields; many high tech companies look for skilled laborers from other countries (demonstrated by rise in visa applications). There are a few topics worth discussion regarding STEM. First, it is important to identify STEM prodigies early. You want to ensure they get the proper education, because technology is so sophisticated and it takes years to learn technical skills. For example, think about the millions of lines of codes running an operating system or search engine; to make a contribution to this type of complex system, a computer engineer must have years of technical experience and knowledge. Second, there must be an education structure to teach necessary technical skills. Teachers need the skills and resources to build their students’ skills. Third, there should be a vehicle to market the skills of a prodigy. They need to get their invention out in the public domain. Once a STEM prodigy is discovered, it is important to fuel their growth and market their skills as soon as possible – so identifying their aptitude at an early stage is advantageous. Exposing children to STEM is important. Two suggestions are to improve science and math education in K – 12 and strengthen the skills of teachers by training them in science, math, and technology. Also, start teaching engineering as early as elementary school. Later in their life, you want to put prodigies on a path of enlightenment. For example, if a student has a perfect score on the math section of their SAT and a low score on the verbal section, then make sure he or she still gets into a top engineering university. 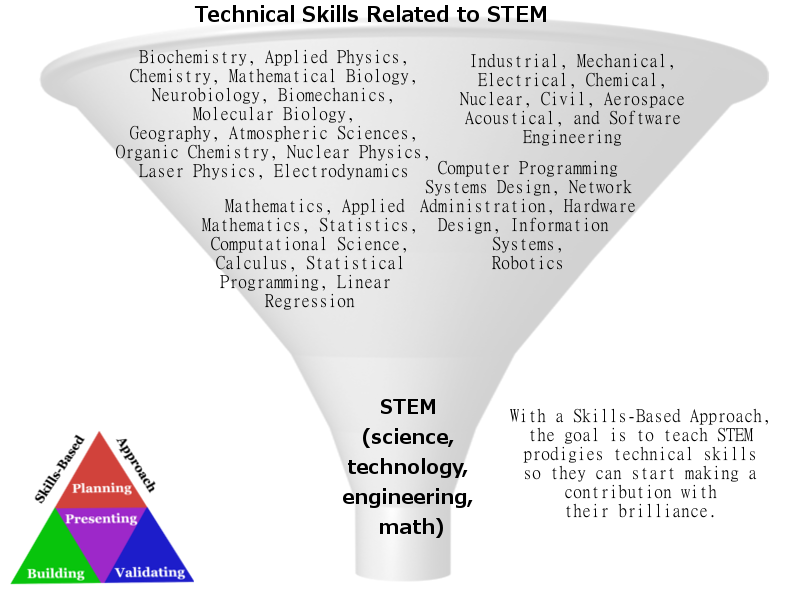 STEM fits with a skills-based approach. STEM fields simply acts as the bottom of a funnel. Many skills make up a particular field, for example, think about how many different types of engineering skills there are: industrial, mechanical, electrical, nuclear, chemical, etc. So it is easier to make education policy decisions based on STEM fields. The prodigies target building technical skills rather than transferable skills; their genius comes from command of transferable skills such as computational thinking or critical reasoning. I read an article about how a Chinese teenage prodigy was put on the fast track to lead a cutting-edge DNA project, for example. Get these prodigies on course to understand the current technology and applications in their chosen discipline, so they can use their brilliance to make a contribution. What Is Going To Replace The Resume? In many previous blogs, I have discussed why I think the standard resume should be replaced by a professional website as the standard employment evaluation platform. I decided to research what published writers are saying in their blogs and articles to answer a few questions: what might replace the resume, why do we need to make a change, and when will this change occur. I am planning to write a series of blogs on this subject, starting with analysis of blogs and articles I have read and then following with a summary of my conclusions. In the Forbes article “5 Reasons Why Your Online Presence Will Replace Your Resume in 10 years”, Dan Schawbel , a guru in career development technology, makes a compelling argument why an “online presence” is going to replace a resume. In previous blogs, I talk about the concept of a professional identity which is essentially the same as what Mr. Schawbel calls an “online presence” (though my discussion centers more on its functionality). Some of the similarities between an online presence and a professional identity include: having a domain name as a primary reference point; ranking high in search engines; displaying as a landing page in social media profiles; and establishing your personal brand. Social media has transformed professional networking and is being used during employment evaluations (51% of HR professionals consider using social media). LinkedIn has developed a sophisticated search mechanism where recruiters can target candidates from their profiles. I think this statement is too strong. According to the survey Employers Seeking Employees, a majority of HR professionals ranked finding and applying to job postings as the most important factor while seeking employment. Basically, Mr. Schawbel suggests there is high employee turnover in part because employees are always looking for the next exciting opportunity and as evidence shares a stat that 84% of employees plan to look for a new job in 2011. Interestingly, the whole idea of a pull approach can support professionals with what I call “casual employment seeking” – where you lure potential employers to your professional website while you are employed. This is not meant to scare employers with the prospect of higher turnover. Most employers tacitly understand the “flight risk” of their employees, so they should keep their employees properly engaged and incentivized. I agree that much of the content on a resume and a professional website is essentially the same, so it is easy to manufacture digital copies instantaneously. I full heartedly agree with this concept as well. This is why a professional website has many ways to infuse your passion into the website including: style and layout of your website, using video content, a blog, and “body of work”. Mr. Schawbel’s blog entries and articles are all over the internet as he is probably the most prominent author on the subject of professional branding. I agree with his prediction that the basic one-dimensional resume of today will be morphed into something more advanced in the future, though I think it is necessary to understand it is going to take time; he says in 10 years. So if you are seeking employment, I recommend not abandoning the traditional approach of finding and applying to job listings. And you should build a professional brand where you share your passions and aspirations, which is easier to do with other forms of media than a typical tabular resume. Finally, it is necessary to “get found” – where recruiters and HR professionals can find you in social media (LinkedIn, Facebook, and Twitter), job search boards (MonsterJobs and CareerBuilder), and online searches (Google, Yahoo, and Bing). And we agree that you should link back to your professional identity (“online presence”) whenever possible. My application of Mr. Schawbel’s “online presence” (or professional identity) is a professional website. I believe a professional website serves all the functions of an “online presence” and more. A professional website is a multi-dimensional resume with a standardized structure and elements – something that is crucial to be an effective employment evaluation platform. There has to be a “pre-defined” structure, so individuals making the evaluations know where to find what they are looking for and have a common platform to make comparisons of their target list of candidates; so I disagree with Mr. Schawbel when he suggests the resume will completely go away, remnants will remain. In addition, a professional website supports the presentation of all types of media in one place. Author TheProfessionalWebsitePosted on November 26, 2012 November 27, 2012 Categories Online IdentityTags career development, employment, professional identity, technologyLeave a comment on What Is Going To Replace The Resume?